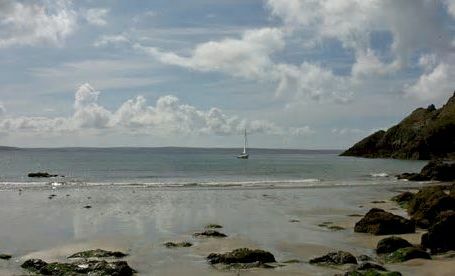 Hidden away on the southwest tip of Wales, Pembrokeshire may be off the beaten track, yet it is a big Welsh star. Forget all the old stereotypes associated with Wales: rain, bleak mining towns and gloomy chapels; travel writers have recently christened Pembrokeshire ‘the new Cornwall’, the ‘California of Wales’ and ‘Little England’. And they are not wrong. Like Cornwall, Pembrokeshire has a jaw-dropping coastline of romantic craggy cliffs and beautiful sandy beaches (31 of which proudly boast Blue Flag status). It does have a flavour of California: surfers flock here, the water is warmed by the Gulf Stream and the county is one of the three sunniest places in the UK. 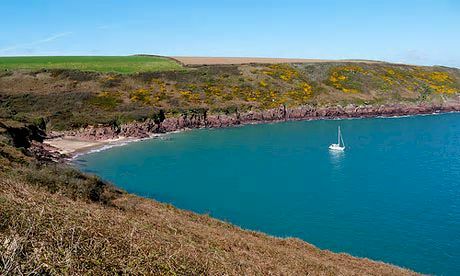 As for the ‘Little England’ nickname, Pembrokeshire has in fact been called this beyond Wales for centuries, owing to the Anglo-Norman invasion of the 11th century. This resulted in a string of English castles, defensive forts and settlements – and to this day, a noticeable English culture endures throughout the region. 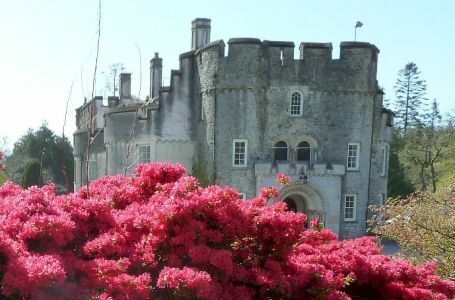 Indeed, south Pembrokeshire has been a holiday favourite of the English since the 18th century, when the French wars forced them to holiday close to home, and Tenby in southeast Pembrokeshire became a fashionable place to take the waters. That said, there is plenty of wonderful Welsh culture and history in Pembrokeshire, from St Davids (birthplace of Wales’ patron saint) to a wealth of Stone Age monuments. There is also a growing sense of Welsh confidence and style, reflected in a crop of new boutique hotels and chic restaurants that possess a modern flair while staying true to the area’s roots. Those roots go deep. Humans lived in the area as long ago as 10,000BC in caves around Tenby. And for such a sleepy and remote place, Pembrokeshire’s history has had a huge influence on Britain’s history. Take Beddarthur, for example, in the Preseli Hills near Newport. Built by the Neolithic residents of Pembrokeshire, this stone circle is thought to have inspired Stonehenge. Next door to it, the bluestones from Cam Menyn, a Megalithic quarry, were actually exported to Wiltshire and used to build Stonehenge. And the dolmens at Pentire Ifan, east of Newport and the biggest Megalithic site in Wales, also resemble a mini-Stonehenge and predate the more famous monument by about 1000 years. 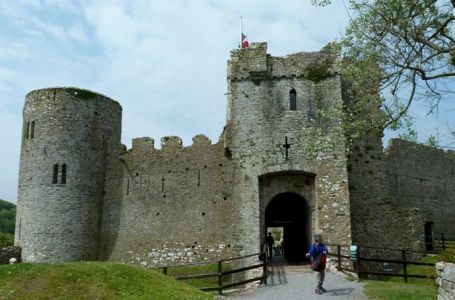 Pembrokeshire’s medieval period was also influential. In the fifth century, St David, a Celtic monk and missionary, brought Christianity to the pagans of western Britain. After his death, St Davids Cathedral became a place of pilgrimage (at one point, the Pope decreed that two visits to St Davids equalled one to Jurusalem). Today, the ornate and beautifully aged cathedral – this version dates from the 12th century – is still worth a pilgrimage, as is the nearby romantic ruin of the Bishop’s Palace, built in 1328. This corner of the country also bore the brunt of many Viking invasions during the ninth century, hence the Scandinavian names of the islands near St Davids: Skomer, Skokholm and Grassholm. The islands are now bird sanctuaries, and can be visited by boat during Spring and Summer. Pembrokeshire was also the birthplace of the Tudor Dynasty. 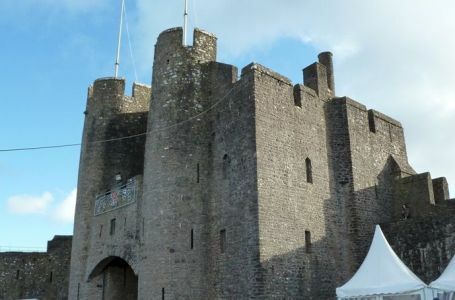 Henry Tudor came into the world at Pembroke Castle in 1457. In 1485, he set off with his army to defeat Richard III at Bosworth, ascending to the throne as Henry VII and, soon after, fathering Henry VIII. And finally, Pembrokeshire was the site of the last foreign invasion of Britain, and a rather comical one at that. In 1797, about 1400 French troops landed near Strumble Head, Fishguard, but surrendered when they thought they were outnumbered by the vast army of British redcoats in the field above – it turned out the ‘redcoats’ were actually women dressed in traditional Welsh tunics and tall black hats. But most people don’t go to Pembrokeshire for the history: they go for the beaches, and Tenby combines the best of both worlds. Located on the south coast, it has impeccable white sands and a pleasing sense of faded grandeur with its classic Georgian buildings, old-fashioned street lamps and elegant seafront promenade, as well as a ruined castle and medieval city wall. The beaches around St Davids, on the west coast, are even better. Broad Haven is gorgeously framed by dramatic, craggy cliffs, even if the town’s ambience is a bit ‘bucket and spade’. Newgale, a long and sweeping strand frequented by surfers, is truly magnificent: the coastal road above it resembles California’s scenic Pacific Coast Highway. Just outside St Davids, pristine Whitesands is a smaller surfer’s paradise, but just as good-looking, especially at sunset. After your swim, stick around St Davids itself and soak up the atmosphere. Known as Britain’s smallest city because of the cathedral, it is actually a village. But for all it’s history, it feels modern and slightly bohemian, with trendy cafes, an organic ice cream parlour, sophisticated foodie restaurants, art galleries and an outdoor adventure store. The latter caters to the sporty types who come here to rock climb, surf, hike and kayak. 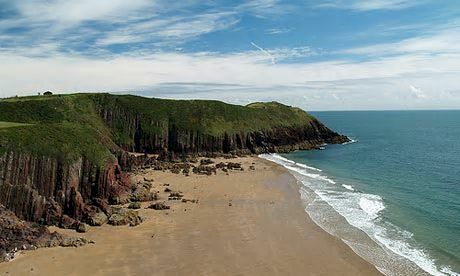 Newport, west of St Davids along the north coast, also has a gem of a beach: Newport Sands, a mile-long strand backed by sand dunes, cliffs and a golf course. In the village, pastel cottages and narrow streets are pleasingly old-world, but despite all the Stone Age sites nearby, Newport is not stuck in the past. It has a burgeoning foodie scene; a prime example is Llys Meddyg, a chic boutique hotel and restaurant featuring Welsh fusion cuisine. Nearby Fishguard lacks great beaches, but it’s coastal scenery is powerful, particularly at wild and windswept Strumble Head, where a lighthouse perches above a raging sea. This is Wales’s closest point to Ireland. Fishguard is not as charming as Newport, but the old town by the harbour has real character. And Fishguard must have some literary residents, as the excellent Seaways bookshop stocks an impressive selection of wordy tomes. If you are more interested in beaches than in history or culture, head back to the south coast. 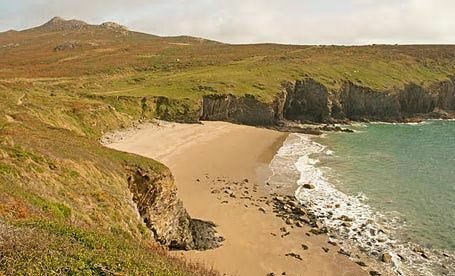 Barafundle Bay, west of Tenby in the Pembrokeshire Coast National Park, is one of the most enchanting spots in Wales. 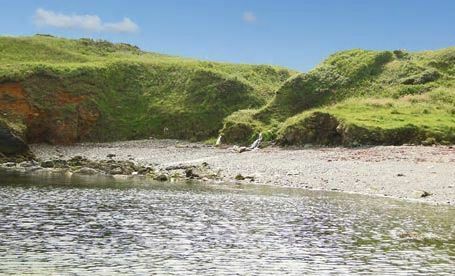 Voted ‘best beach for a picnic’ by readers of Country Life magazine, it is small and sheltered and its calm waters are ideal for family swimming. Nearby, golden Broadhaven South Beach is just as pretty as Barafundle, but more exposed. Freshwater West, 20 miles to the west, is pounded by Atlantic rollers that make for spectacular surfing. Birdwatchers are just as common around here as beach enthusiasts. Stack Rocks, west of Barafundle, is swarming with guillemots, razorbills, kittiwakes and fulmars in the summer. The spectacle is mesmerising, as is the nearby sight of the Green Bridge of Wales, a limestone arch. Equally entrancing is St Govan’s Chapel, eastwards towards Bosherston. With waves crashing below and birds soaring overhead, it is Pembrokeshire in a nutshell: majestic coastal scenery, wildlife, history - and a touch of magic.